A. This isn’t something new…it’s been going on for a long time. Bingo players don’t want you to touch their cards or their daubers; domino players don’t want you to straighten their double 6’s; and you wouldn’t think of touching your poker buddies’ cards. It might have something to do with superstition….but there have also been some mistakes when players exchange for a Joker in exposures….like replacing a 1Bam for a Flower, or a West for a North. Please don’t take it personally. When I teach Mah Jongg I tell the beginning students that no one should ever touch anyone else’s tiles or racks. When you want to exchange a tile for a Joker you extend the tile out to the player with the Joker and politely ask for her Joker. You do not take it off her rack yourself. Why do I teach this way and why am I so adamant about this rule? As it was explained to me, all of this prevents any hint of cheating. I’m not sure that I think too much about that aspect because I would never play with anyone who is suspected of cheating. I think I am just superstitious about this! So, don’t touch my tiles and I won’t touch yours! 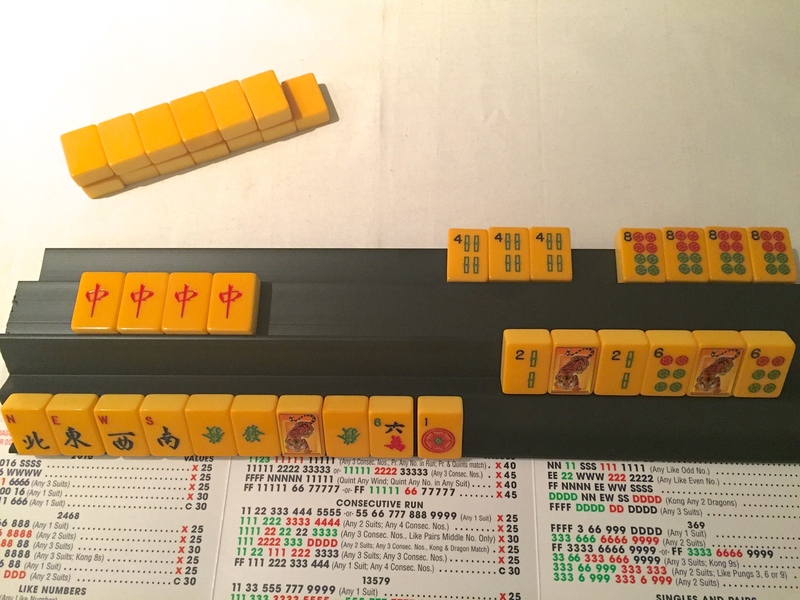 This entry was posted in Mah Jongg and Me and tagged dealer, east, Gladys Grad, Grand Master of American-Style Mah Jongg Tournaments, mah jongg, mah jongg madness, mahjong on March 6, 2019 by Mah Jongg and Me. You probably know that I adore both Gladys Grad, the Grand Master of American-Style Mah Jongg Tournaments, and Lynn Chorn, the owner of the fabulous Mah Jongg website, www.wherethewindsblow.com. What a great delight today for me to see that Gladys has written a wonderful article for Lynn and her website. And it is really an informative and interesting article – one that all of you will want to read, especially for those of you interested in tournament play. 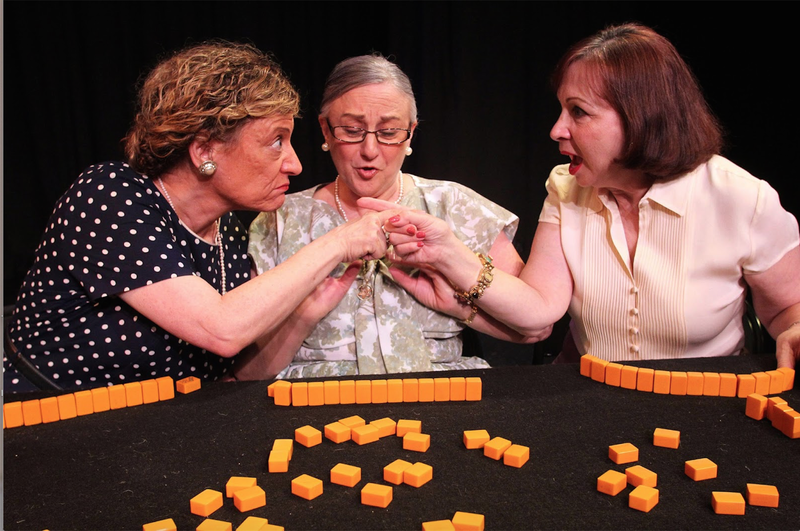 Much thanks to Gladys and Lynn for always providing us with such wonderful Mah Jongg information! This entry was posted in Mah Jongg and Me and tagged Gladys Grad, Grand Master of American-Style Mah Jongg Tournaments, Lynn Chorn, mah jongg, mahjong, www.wherethewindsblow.com on October 21, 2016 by Mah Jongg and Me. On September 27th I posted a question from a reader of this blog – she asked what she should do with someone who was cheating in their friendly (and small) neighborhood games. I gave my response but so many of you were kind enough to chime in. I received more responses than I could possibly re-post but here are a few of them. Be sure to scroll all the way through to the very last response as that one is from the wonderful and very knowledgeable Gladys Grad. I would encourage everyone else to count her tiles continuously, and if she starts moving the discards do as suggested in the blog. If she doesn’t figure it out, then you need to be direct. Very awkward for sure but cheating is cheating and can’t be tolerated even in a neighborhood game. Just keep declaring her dead. That should stop it. Hard to believe that this person thinks she is getting away with cheating. Maybe it’s the thrill of thinking she’s getting away with it…living on the edge. I think Gladys and Ann are right on. Many players get annoyed when discards are moved around because they are visual and remember tiles by their placement on the table. 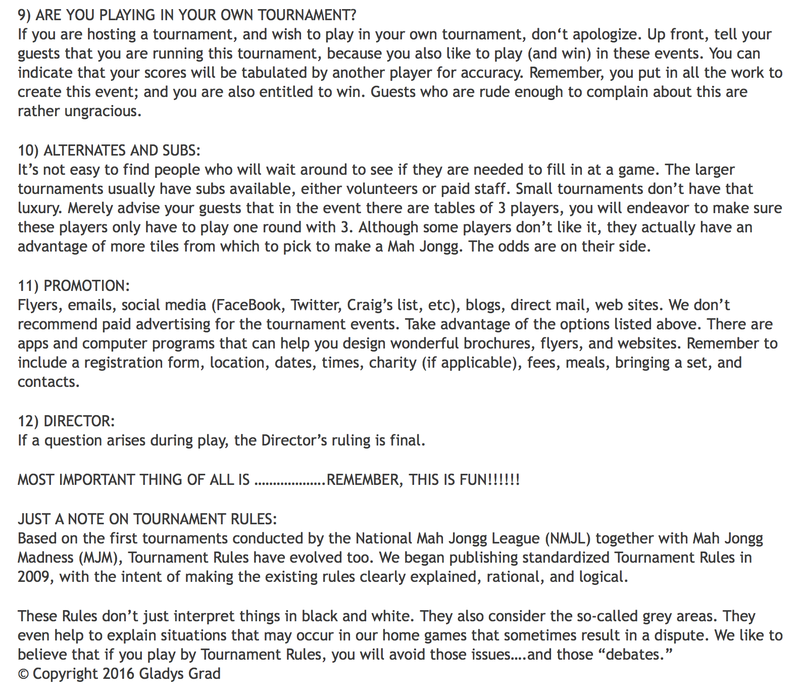 Also, I’ve played in a tournament where hands in front of racks is not allowed. Perhaps you could just say that moving the tiles is distracting and during the next game have one of your players intentionally get caught with 14 tiles on their rack and call her dead. This would serve as fair warning. If the group is playing with loose rules, this could all be presented as an effort by the group to tighten up the game to conform with NMJL rules. However it is handled, it should be stopped before someone loses their patience and creates hurt feelings. If she can’t play by the group’s standards, she will probably find somewhere else to play. Cheaters don’t just cheat in MJ. I broke up a game due to discovering a player cheating. That’s so wrong. Either call her dead every time she had 14 or call her out on it. It is an awkward situation but I wouldn’t want to play with her & suggest telling her outright to stop. I have to agree with the 1st suggestion about leaving all tiles where they are & if you are found to have 14 tiles you are declared dead. She must comply or no longer play with the group. What a shame. The game is supposed to be a fun social get together. To me, there is never any reason to continue playing with somebody who cheats. If she needs the money that badly, take up a collection and put it in a good bye card. Confront, poor character probably in other areas. Fool me once; shame on you. Fool me twice; shame on me. I played in a game for a few years, where two of the ladies ALWAYS made the correct bet. They never wanted to use a better (said friends should trust friends). Well, this friend got tired of it and I just left the game. It did end a friendship. But then again, what kind of a friend cheats for a quarter! I think the suggestions are very diplomatic and should work to stop her behavior but I agree with the response that said the issue runs deeper and I would keep my eye on her in other social situations that she may participate in , such as bridge, etc. It’s unfortunate that someone is desperate enough to make a hand that they would cheat! Tell her you made a new table rule where all hands must be behind the rack because it’s distracting to the other players. Personally, I find it annoying when a player has a need to constantly move the tiles on the table. I would confront her as well. she has no problem taking advantage of her “friends” and cheating. then i would ask her to find another table. believe me…if she cheats in mah jong, it goes deeper than that. 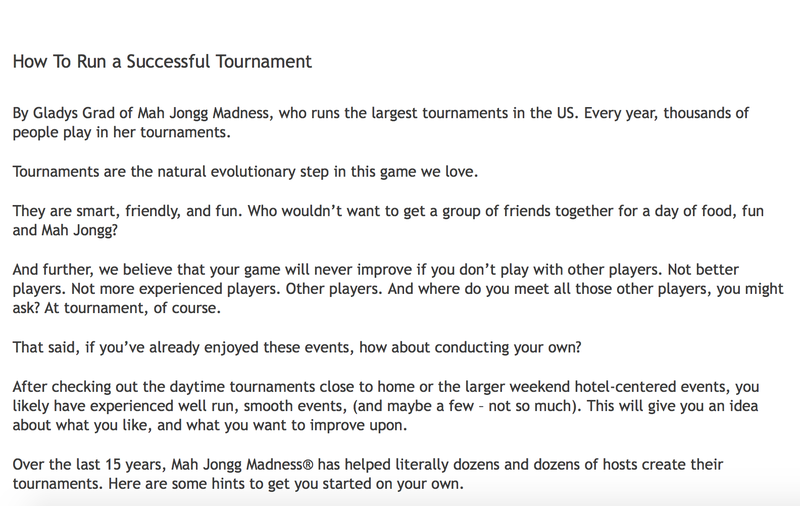 And, finally…from Gladys Grad, the Grand Master of American-Style Mah Jongg Tournaments, comes the definitive response: The hardest thing we face in our tournaments is “firing” someone who has been found cheating. 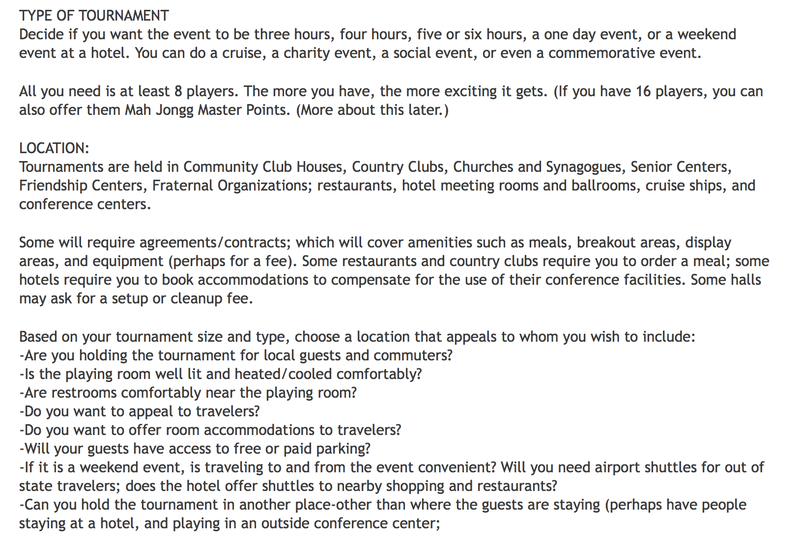 These players are usually good-natured, knowledgeable players….and come to these events with their friends. This makes it particularly tricky because we don’t want to embarrass them in front of their friends. In my previous profession, it was really hard when I had to fire employees; but dis-inviting a MJ player is worse. We warn them (after a thorough “investigation,” of course) …and tell them they can finish the tournament if they wish, so as not to embarrass them further; but they are never allowed back in another tournament of ours. Of course, they are always watched if they decide to play to the end; and their scores are not counted. I do not envy your very difficult position. Your situation is literally in your home. Ann’s solution may be the only way. Much thanks to all of you for your responses! 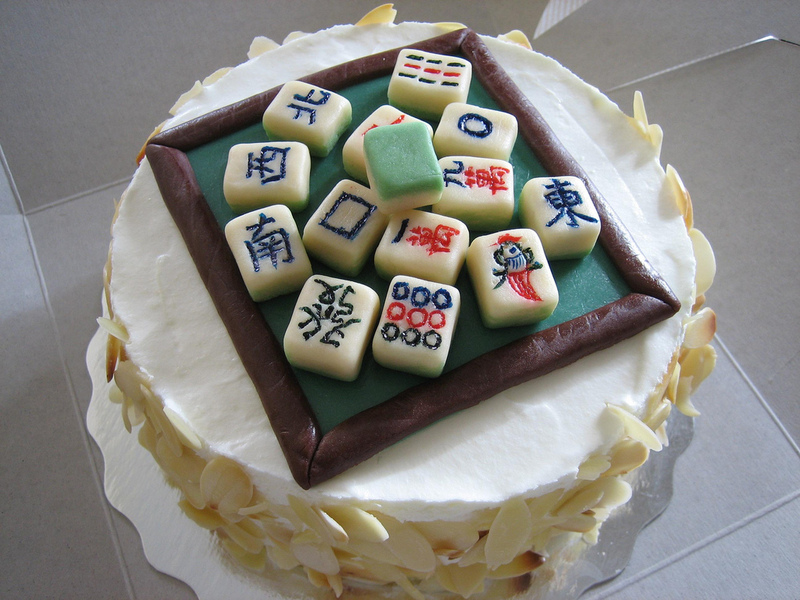 This entry was posted in Mah Jongg and Me and tagged Gladys Grad, Grand Master of American-Style Mah Jongg Tournaments, mah jongg, mahjong on October 17, 2016 by Mah Jongg and Me. Oh, boy – today a package arrived from Sheila and Gil Linderman. 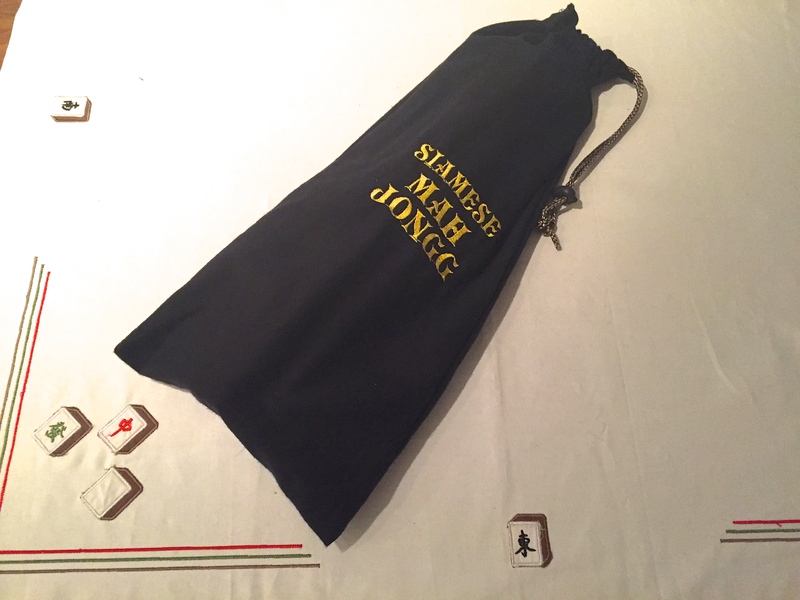 Housed in a beautiful bag, I found two Mah Jongg racks specifically designed for Siamese Mah Jongg…BRILLIANT! Check out how the tiles play out on these special racks – I am loving how clever they are! Gil is the wonderful Glady Grad’s brother and Sheila is his wife – the two of them are both are very talented and have provided wonderful additions to our Mah Jongg accessories. 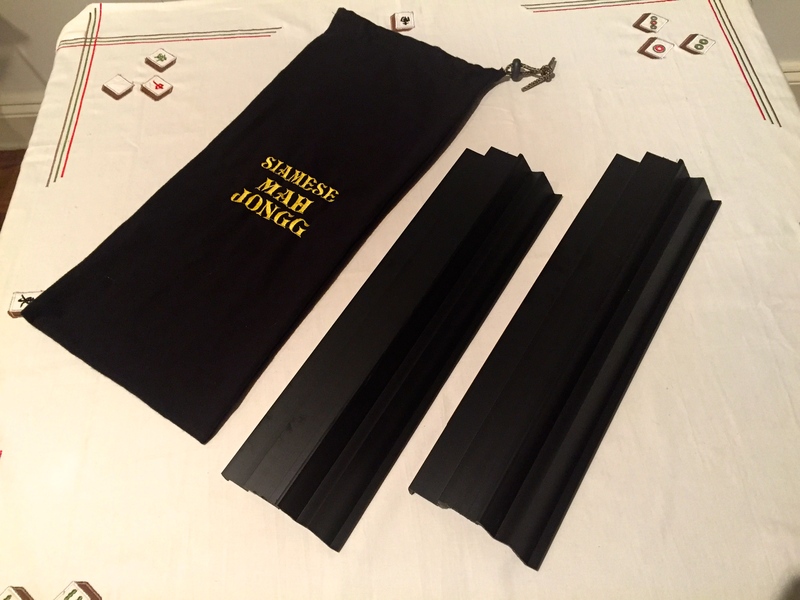 These racks are available now and if you are interested in purchasing them (BTW, a great holiday gift for your Mah Jongg-playing friends! ), contact Gil and Sheila at glinderman@aol.com. Now that I am playing Siamese Mah Jongg using these racks, I don’t know how I ever lived without them! This entry was posted in Mah Jongg and Me and tagged Gil Linderman, Gladys Grad, Grand Master of American-Style Mah Jongg Tournaments, mah jongg, mahjong, Siamese on October 15, 2016 by Mah Jongg and Me. 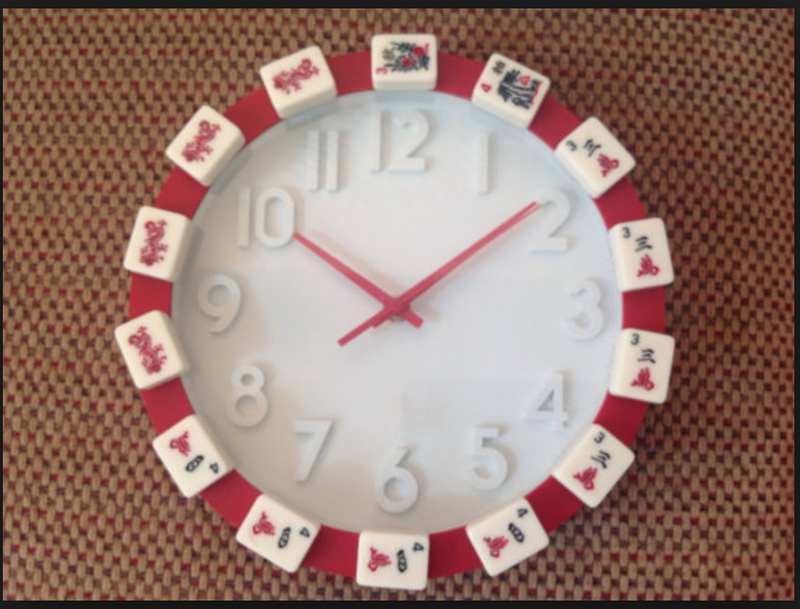 IT’S ALWAYS TIME TO PLAY MAH JONGG! NERVOUS ABOUT PLAYING IN A TOURNAMENT? For those players who stress about so-called “tournament speed,”…..please don’t let it bother you. We should all be playing at least 4 games in an hour in our friendly home games. (Many play 5 games in that time.) Tournaments sometimes have a 55 minute round. Plenty of time to complete all 4 of your games; even if you take some time to figure out your hands. It’s rare for players to go over the time limit. And remember, only the first game in a tournament is daunting….after that, it’s just a group of players – playing the game we all love. And it’s a lot of fun. How long does it take your group to play a game? Let me know. 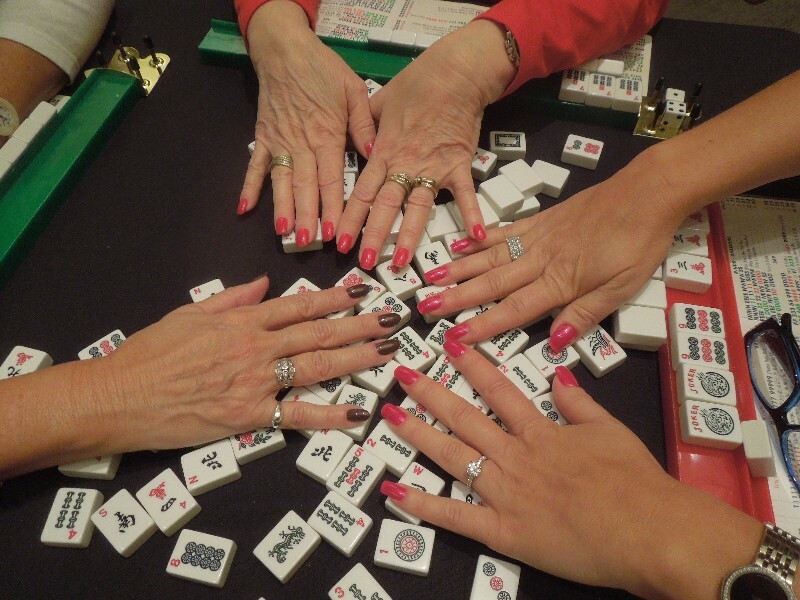 This entry was posted in Mah Jongg and Me and tagged Gladys Grad, Grand Master of American-Style Mah Jongg Tournaments, mah jongg, mahjong on August 30, 2016 by Mah Jongg and Me. Gladys Grad, the Grand Master of American-Style Mah Jongg Tournaments, is always thinking of ways to improve our beloved game. 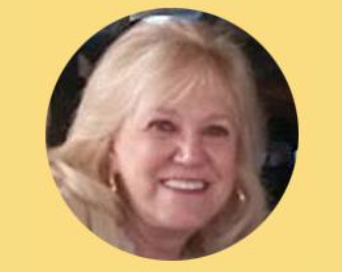 In her October newsletter Gladys listed some ideas to add to your games at home. 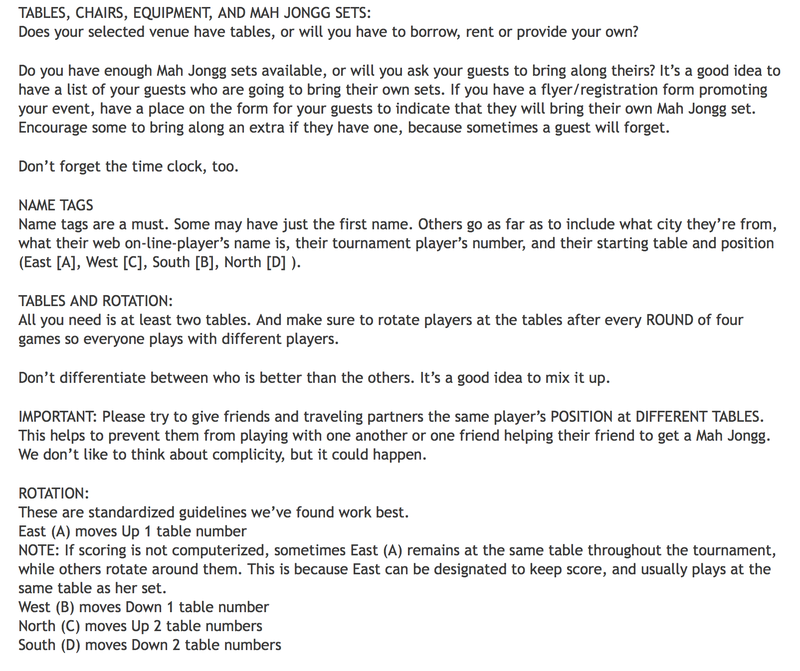 As she notes, these are NOT sanctioned by the National Mah Jongg League (NMJL) or by Mah Jongg Master Point tournaments, but they might be something new to add to your social games. 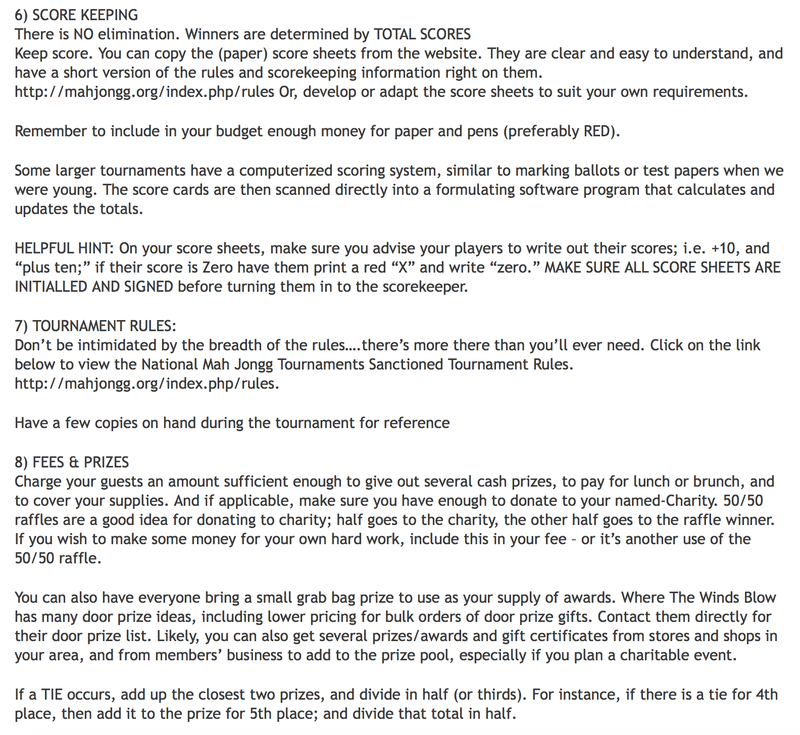 Have any of you incorporated these ideas into your games? Or do you have any other ideas? Let me know and I will post them. BTW, I know the controversy surrounding ‘picking ahead” and I agree with you! 7) JOKERS-IN Everyone starts with 1 Joker. 8) BUY A JOKER. 4 Jokers are left out of the walls. The remaining 4 Jokers are mixed into the walls as usual. After East throws out the starting tile, but before a first exposure is made by each individual player, and before they pick to begin their next turn….a player can “buy” a Joker for $$0.50 or 1.00 (which is added to the winner’s pot). Players are limited to buying only one (1) Joker, and ONLY if they DON’T ALREADY HAVE A JOKER IN THEIR HAND. Remember to discard a tile after you’ve “bought” your Joker to begin your turn. Honesty prevails here. You can NOT “buy” a Joker for Mah Jongg. If all 4 of these Jokers (1 each) aren’t bought by each player, none of the remaining of the 4 Jokers can be placed back in the wall for other players to pick. 9) EXCHANGE A JOKER FOR A SYMBOL TILE IN AN EXPOSURE (instead of vice versa). This would help if someone exposed 3 or 4 of the tiles you needed for a single or pair. 11) Take a Clue from the CHINESE game. If you have 4 Flowers in your hand, and the numbers on the Folwers are consecutive 1,2,3,4, or SPR, SUM, AUT, WIN, you will get double the payment for your MJ hand, over and above your regular payment. You are also able to exchange a flower in it’s exposure, if you pick it and exchange it yourself. 12) The NMJL has increased, and subsequently decreased, the number of Flowers several times from its inception in 1937 to 1971. Then they added 2 Jokers to the game in 1960; and up to 8 Jokers in 1967. Creativity and evolution are the building blocks for almost any game to gain in popularity and continuing success. Do you have any ideas you currently use, or you’d like to see implemented in your own game…or an idea you wish would be considered by the NMJL for the official game? This entry was posted in Mah Jongg and Me and tagged Atomic, futures, Gladys Grad, Grand Master of American-Style Mah Jongg Tournaments, hot wall cold wall, mah jongg, mahjong, National Mah Jongg League, nmjl, picking ahead on November 5, 2015 by Mah Jongg and Me.